RESIDENTS at the Air Force Memorial Estate in Bull Creek have a new way to stay connected with the community and outdoors. The Royal Australian Air Force Association of WA (RAAFA) recently invested in an electric trishaw, a light three-wheeled vehicle. The trishaw, to be piloted by volunteers, will allow residents to go on scenic cycles. The buy is part of RAAFA’s wellness and lifestyle program, with the nursing home the first in the state to purchase one for residents. “It increases their quality of life and is an opportunity to get outside,” allied health co-ordinator Aimee Curtis said. “It gives them the opportunity to experience something they would have when they were younger. “A lot of them didn’t have cars back in the day, so bike riding was a staple of their transport. 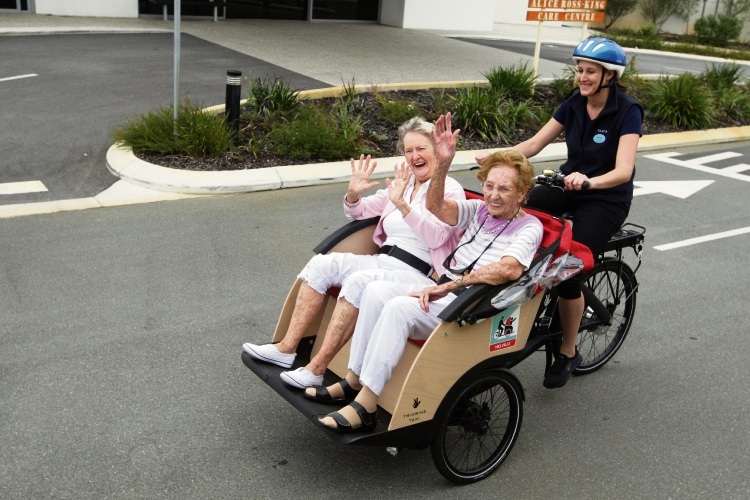 The purchase came about thanks to a partnership with international not-for-profit Cycling Without Age, which connects elderly people with the community and outdoors. The electric-powered bike was built in Denmark and recently shipped over. Ms Curtis is now looking for volunteers to take residents on rides. She said it would be perfect for anyone that is happy to have a conversation and help residents get out and about. If you would like to volunteer, contact 9324 0000 or email acurtis@raafawa.org.au or wa@cyclingwithoutage.org.au. Air Force Memorial Estate residents Maureen Nichols and Miriam Winter with allied health co-ordinator Aimee Curtis.